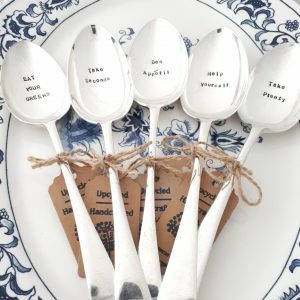 I have bought some gorgeous serving spoons that say ‘Take plenty’ and ‘Help yourself’ perfect for the Christmas buffet table- they arrived the next day hand wrapped in brown tissue with a twine bow (no useless extra packaging very eco friendly ) and looked charming. They are unique vintage and really well priced. There is a curry lovers gift box with ingredients and cutlery that is a great gift for that difficult boss or uncle for £20. Partnering with small producers like ‘Curry with love’ from Suffolk and ‘Georgie Porgies’ in Devon means unique gifts for foodies. Great to support a small business and Vicky the owner obviously cares so much about keeping it personal. I am sure my gifts will be cherished for years to come.